Most visitors to Rome get to the Colosseum and the Forum, but many overlook nearby Palatine Hill, which not only provides an extraordinary view of both but includes the colorful home of Caesar Augustus. According to Roman mythology, Palatine Hill, the centermost of Rome’s seven hills, included the cave in which a she-wolf nurtured the infant twins Romulus and Remus. Romulus later founded Rome on Palatine Hill after killing Remus, who wanted instead to build a city on Aventine Hill. Rome, named for Romulus, expanded onto the surrounding hills. In 31 B.C., after Octavian defeated forces loyal to Mark Antony and Cleopatra, becoming Rome’s unquestioned leader, Romans hailed him as the new Romulus. Octavian acknowledged the connection, constructing a house on Palatine Hill near a hut where Romulus reportedly once lived. In 27 B.C., the Roman Senate gave Octavian the title “Augustus,” by which he was known when he became the first Roman Emperor. As Emperor, Augustus made the house on Palatine Hill his official residence until his death in 14 A.D. Although contemporary writers thought the house was too modest for Rome’s powerful emperor, it was sufficiently impressive that the words “palatial” and “palace” come from the house’s Palatine Hill location. Augustus’ palace was apparently destroyed by fire during the reign of Emperor Nero and its exact location was lost until 1961, when archaeologists discovered the buried house and began excavations and meticulous restorations. The two-story stone house was opened to the public in 2008, highlighting rooms adorned with still-vibrant frescoes. The large Oecus (Banquet) Room and smaller Mask Room display theatrical images, including comedic and tragic masks. The Pine Room features pine garlands honoring Cybele, the goddess of fertility. 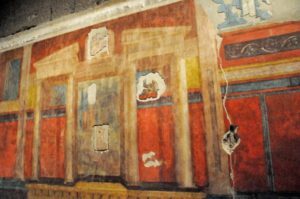 Augustus’ house on Palatine Hill gives visitors an unexpected visual treat. The next time you are in Rome, stop by.